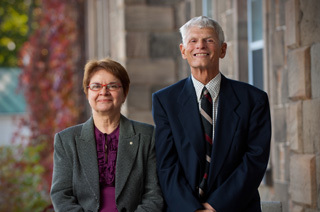 Margaret Conrad and Roger Ploude will join the ranks of professors emeriti at the University of New Brunswick. They will receive the honorary emeritus designation at UNB Fredericton’s fall Convocation, Oct. 21, in recognition of their distinguished careers. Margaret Conrad came to UNB in 2002 as the university’s first female Canada Research Chair in Atlantic Canada Studies. She is a distinguished historian who has published widely in the fields of Atlantic Canada history and Women’s Studies. During her 40-year university career, Dr. Conrad published research on the Atlantic region’s early settlers and 20th century political economy, made sources for research more accessible through old and new media, produced highly-popular textbooks on Canada and Atlantic Canada, and forged connections between academics and the public. She was the driving force behind the Atlantic Canada Portal, designed to support research on the Atlantic region. Dr. Conrad also helped to lay the foundation for Women’s Studies in Canada. A founding editor of Atlantis: A Women’s Studies Journal, she is co-author of No Place Like Home: The Diaries and Letters of Nova Scotia Women, which changed the way we understand women’s work and family life. She is a Fellow of the Royal Society of Canada, a recipient of the Queen's Golden Jubilee Medal, and an Officer of the Order of Canada. She currently holds the position of Honorary Research Professor at UNB where she continues to explore aspects Humanities Computing with the support of the Electronic Text Centre. During his 38 years at UNB, Roger Ploude distinguished himself as a scholar, teacher, administrator, adviser and author. He served as chair of the department of English for 18 of those 38 years, where he worked to create a harmonious and collegial environment. In addition to an often heavy administrative workload, Dr. Ploude devoted much of his time to teaching and to his students. He was the recipient of the Allan P. Stuart Award for Excellence in Teaching and taught courses at all levels, from the large first-year courses to graduate seminars, in his speciality of 19th century poetry and prose. His commitment to education has also benefited the educational community outside of UNB. As chief examiner of the Provincial Achievement Test in High School English, Dr. Ploude was responsible for overseeing the creation of a provincial examination for Grade 11 English students. He also worked with high schools across the province on ways to improve instruction and increase consistency in grading. Dr. Ploude was involved in the early years of the department’s flagship journals. He co-founded Studies in Canadian Literature and served as The Fiddlehead’s editor and business manager for eight years, and in 1995 he co-edited Fiddlehead Gold, the journal’s fiftieth anniversary volume.